Speaking of beautifully-built pianos from the Far East, today I introduce you to the Kawai K6 – one of the finest upright pianos on earth. As with the Yamaha U-series, the core components of each K6 piano are almost identical making each piano of consistently high-quality. It stands at a towering 132 cm giving the bass notes a richness rivalling many concert grands. 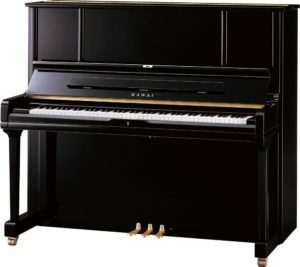 Kawai pianos, like Yamahas, increase in value every year meaning it could potentially become an investment. Carbon fibre action is gives a very consistent touch. Regulation is usually quick and easy for the piano tuner. Its polished ebony-finish makes it a piece of furniture that could beautifully adorn your front room. Needless to say, if you’re thinking about investing in a new piano it’s always a good idea to try out several to see which has a touch and tone to your liking. A complaint I sometimes hear in the piano industry is that Japanese pianos can be too bright for some people. Personally, I love their sound – but I can see why someone accustomed to the darker sound of their old Welmar or Knight piano might find a Kawai or Yamaha too bright in comparison. The acoustics of the room also have to be taken into account when choosing a piano. The last time I tuned a Kawai K6 was at the Crucible theatre in Sheffield and the natural reverberation of the theatre hall sounded truly spectacular.